Supersole is a musician based in London, UK. She belongs to that odd generation of bedroom artists which create tunes with a home computer when the night sets in and everyone else is sleeping or watching tv. She’s been making odd music since she first put her hands on a Casio PT-100 keyboard. When she then discovered Scream Tracker, she knew that was what she needed for making even more of her personal music, and she’s continued like that for more than 10 years. It seriously started with a CASIO PT-100. Before, I could only dream of convincing people to let me use their new and shiny CASIO PT-82's, with their funky row of green and red LED lights. The PT100 had six notes of polyphony, which enabled me to learn naturally about the concept of chords. First I tried to find out the notes of almost every song which I listened to, and when I was done with that, I began creating music for stories that I liked. I even dared to compose a very primitive soundtrack for Lord of the Rings, which I was reading by that time and had me absolutely hooked. All that is left from this phase are some tape recordings, stored somewhere in my old shelves. More or less at the same time, I made my first incursions in computing, by learning how to program with an Amstrad PCW 8256 and LOGO. There were few magazines which spoke about PCW's and one of those was Amstrad User, whose topics not only included PCW's but also the CPC range of computers. 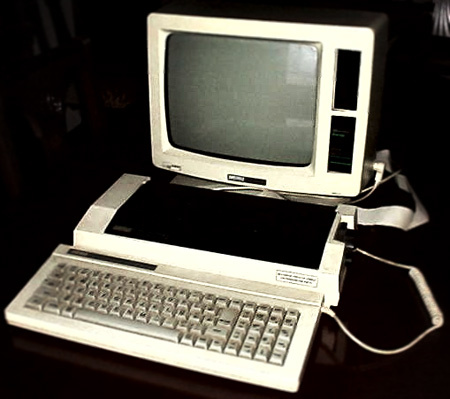 Although these were considered as having less possibilities and being less serious and professional, I envied the owners of those minor machines because they had a sound chip with three channels (the AY-3-8912), whereas the best one could achieve with a PCW regarding sound was to control the length of the beeps. Not to forget the fact that it was absolutely monochrome. A couple of years later we entered the PC era with an Amstrad (again) 2286. The sound was very rudimentary for nowadays standards, since it was just the speaker's sound, but it was fun nevertheless. I even wrote some kind of graphical adventures including sounds, with Basic. Luckily for all of you, I think that everything got lost in a hard disk crash. Then one day a floppy disk fell in my hands. It was an special sounds issue where a computer magazine dedicated the gross of its pages to compare sound cards, which were the latest trend at that time ( multimedia being the magical buzz word). The disk included four .mod files and two programs titled Vangelis Tracker and Vangelis Player. I had no clue about what those MOD files were, and opening them with the editor from Norton Commander didn't yield any success since they weren't plain text files, so I tried to execute the programs. I then found that Vangelis Player could be used for opening the .mod files included with the disk, which were tracked songs, and it could emulate a sound card, so it played the songs through the internal speaker. That was absolutely awesome! (for the record, the only of the four files which I remember was Aerodynamisk neger). And there I was, left wondering how could I do the same. I wanted to be able to do music like that. It sounded way better than GW-BASIC's SOUND instruction. But Vangelis Tracker didn't work on that computer; I believe it required at least a 386 or a GUS card, and I had neither of them. I tried to alter manually the binary mod files with an hex editor but it obviously didn't produce any useful result. Two more years and we got a better PC, this time with sound card and all that. Luckily for me, it was the best moment for computer creatives, since the very popular PCMania magazine used to organise monthly music and graphics competitions, and they also included a copy of Scream tracker 3 in the magazine's CD, along with around one hundred of participating songs, each month. That was a whole new world, something very, very interesting. I slowly learnt how the program worked, and it didn't take long until I began making songs with it, although I still waited several months before daring to submit anything to the contest. The result was plain crazy. I began to receive fan-mail, which I never fully understood since I had only sent a simple song. And I hadn't even won! Easy to suspect, the reason for that was me being a girl. Maybe there were two or three girls more in the contest. I bet they also received lots of fan mail like me! Leaving aside the crazy fan letters, I liked the sense of community there; long before Radiohead and all those copyleft and creative commons people had even thought of distributing their songs in the internets, we were freely sharing our songs —as long as you respected the authorship of the songs, that is. We could also see the source of the tracks, learn from them, rip all the samples as we wished, remix each other and build mash ups and all that social community malarkey. Funny thing is, everything happened thanks to and inside the magazine's CD. 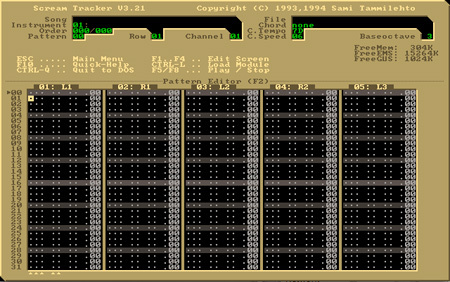 The concept of tracker groups began to shape, probably inherited from the demoscene groups. I joined Dream Tracker Team in 1997. I had been offered to join what went to be our competition later on, Klymax, but I think I declined because I had already said yes to DTT and I didn't want to split myself in two, neither have to think of another handle. DTT's organizer (Simpa) had said that I needed a handle - I couldn't use Sole for signing my songs! I tried to come with something of my own but couldn't get anything cool. At the end I just picked a German dictionary and opened it randomly. I found Was ist los? (which means how do you do?) and thought it could work. Occasionally I shortened it to wil? and a bit later I joined both together, as in sole/wil? which was supposed to mean: it's sole also known as wil?, but it mainly confused people, which understood that either wil? was my group name or that wil? was a co-composer. The group organizer main task was to promote the group's catalogue, recruit new members and make sure they gained as much popularity as possible. Doesn't it sound like a netlabel? It indeed worked a lot like that, only the term hadn't been invented yet. There was also something called Club de trackers ( Trackers club ), which a guy called Overflow had created on the web space that his university provided him. I found about that the first time I went into my uni's internet room and searched for "impulse tracker" in altavista. It was great to find something like Pcmania's contest but on a more global scale. I began to find more networks such as #trax, united trackers, and later, the (in)famously known traxinspace. DTT had a peak of popularity, when we began to win the monthly compo with our dance songs. Unfortunately, it didn't last too long since most of the members retired from the tracking scene for several reasons. I personally couldn't do anything because I hadn't a computer of my own which I could bring with me where the uni was, so I stopped producing anything for a couple of years. But I finally got enough money for buying a brand new computer which enabled me to create lots of songs. And when I say lots, I really mean a lot. I also began to use better samples, and buying Future Music and Computer Music, which provided sample cd's with good quality samples. I was already using Impulse Tracker or Fast Tracker indistinctly and my sound card was a SBLive!, much better than the Sound Blaster 16 that I had been using until then (the Maxi Sound 64 that I won on the monthly contest looked nice in the specifications but introduced an incredible amount of noise in the mixer). Although most of my released songs from that interval are dance tracks, I experimented with everything that I could think of. The strangest the sample, the better. On the other hand, A-track, the organiser from the second group I joined (Background Music Revolution!) was trying to get us signed for some real records company, so if we wanted to get the deal, we had to follow the more conventional dance rules. It was also when trance got very popular (think Paul Van Dyk, Tiesto, etc) so we had to do trance, which I personally didn't like very much. So I progressively distanced from the group and also got slightly unmotivated with the tracking scene as a whole for a number of reasons, and finally stopped doing anything. On June 2002 I went to Euskal Party with a few mates from the uni. I thought that it would be courteous to bring some production with me instead of going empty handed, so I did my best for the tracked compo, and released Last night in Atlantis . I got completely hooked by what I saw there. Trace and mac from (then) threepixels were working on their MDMA demo, using that home-made demo editor and then there was the 4k dominoes by fuzzion with synthesized sound... I had been doing some opengl programming for a subject I had taken that year and I decided that I wanted to do things like those. I also began to get song requests for demos and intros - which had to be in tracked format for ease of use, so I began to do tracked music again, and this time the style was even more heterogeneous than before. I also learnt more about chiptunes and tune optimising, to make them fit into intros. Some time after I got a better computer and began experimenting with software synths like Reason and what can be done with these modular environments. I'm doing very slow music now (probably because I have already done lots of fast songs already) and although I keep having a strong melodic base I'm introducing some more dissonant and noisy elements occasionally. Casio PT82 picture taken from this page, which is a very interesting read in itself if you're curious about what these little toy-keyboards held inside. Amstrad PCW8256 picture taken from Retroinformatica Amstrad PCW 8256.